READ BIO - Read bio on Panos Prevedouros. DONATE - Please donate what you can to help. Panos is not a politician, he has no special interests supporting him, (a good thing!) so needs contributions from all of us to keep his campaign on the road. Mahalo for your help! VISIT WEBSITE - Panos can win. Press releases, learn the issues, blog, testimonials, and so much more. 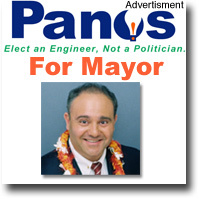 PRESS RELEASES - Get the latest scoop on from the Panos Prevedouros for Mayor campaign. VOLUNTEER - We Need Your Help! How to volunteer for Panos Prevedouros. Canvassing, Host a talk story event, Sign waving, Yard sign, Friend to friend cards, Phone banking, General volunteer and more. HAVE PANOS APPEAR AT YOUR EVENT! - Get to know Panos Prevedouros up close. Share your concerns and ask him your questions personally! PUT UP A YARDSIGN - Put Up A Yardsign - Yardsign Center - Spread the Word. Click here to request a Panos Prevedouros yard sign or report a damage or stolen sign. Prevedouros comes from a family of entrepreneurs and engineers. His parents were small business owners. His sister and brother and two of his uncles are engineers. Also Panos' step-son graduated from the UH with a degree in civil engineering and now pursues a Masters at U. of Arizona. 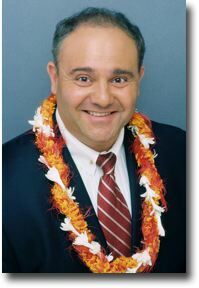 Prevedouros was a candidate for Mayor for City and County of Honolulu, received 28,792 votes or 17.2% in the primary Election in September, 2008. He announced his intent to become a candidate for 2010 mayor election of the City and County of Honolulu in February 2010. Prevedouros served on the Technical Advisory Committee of Oahu Metropolitan Planning Organization, 2003-2004, was a City Council-appointed member of a 7-person Transit Advisory Task Force (Honolulu High-Capacity Transit Corridor Project), Honolulu, 2006, and was the Council Chair's appointee on the 5- member expert panel for the selection of fixed guideway technology for Honolulu, 2008. From 2006 to 2008 he was president of the Hawaii Highway Users Alliance. He was named one of the "50 people who Rocked Hawaii in 2003 " by the Hawaii Reporter, one of Ten People Who Made a Difference in Hawaii in 2008, by the Star Bulletin, and one of Hawaii's Seven Superheroes, by the Hawaii Reporter, 2009. He is a Registered Professional Engineer in the European Union, and court-qualified Traffic and Transportation Engineering expert in Hawaii. His professional expertise is in urban road network management, incident management, traffic flow analysis, traffic signal optimization, intelligent transportation systems, demand forecasting, and evaluation of transportation alternatives, sustainable infrastructure and transportation systems, policies, and regulations. Prevedouros received the best Paper Award on Transportation Noise, TRB of the National Academies, 1995; the Outstanding Faculty Award, American Society of Civil Engineers-Hawaii, 1996; the Van Wagoner Award for Urban Underpasses, Institute of Transportation Engineers, 2005; and the Freeway Operations Service Award, TRB, National Academies, 2009. Prevedouros has been assisting both Hawaii Department of Transportation and Attica Tollway in constructing improvements to lessen the impact of freeway bottlenecks. In addition to the State of Hawaii, City of Honolulu, Oahu Metropolitan Planning Organization and Attica Tollway, Prevedouros consulted for Wiss, Janney, Elstner Associates, Inc. • Reinwald, O'Connor and Playdon • Law Offices of Howard J. Gravelle. Wayson Chow, Esq .• Law Offices of Richard Turbin. Edwin A. Ebisui, Jr.,Esq .• Kemper and Watts. Intracom, S.A., Athens, Greece. Intramet, S.A., Larissa, Greece. M. R. Wolfe & Associates, Attorneys - Planners, San Francisco, CA • The lEI Group, Boston, MA • The R. M. Towill Corporation. The Alliance for Traffic Improvement. Iwan - Cray, Chicago, IL • Cambridge Systematics, Inc., Cambridge, MA • Berkeley Transportation Systems, Berkeley CA • Wilbur Smith Associates, Eastport, NY • Pacific Power Sails, Maui • Pacific International Center for High Technology Research (PICHTR) • Volcanoes National Park, Big Island. kaimukihawaii.com cannot guarantee the accuracy of any Directory Profile. kaimukihawaii.com maintains this Directory Profile for your personal entertainment, information, education, and communication. kaimukihawaii.com assumes no responsibility for any aspect of the above Directory Profile. kaimukihawaii.com has not reviewed all of the sites linked from this Directory Profile and is not responsible for the contents of any off-site pages or any other sites linked to the Site. Your linking to any other off-site pages or other sites is at your own risk. Call Ernest at 808-739-9797 to get a candidate profile.